A dozen dusty riders cycle past a sign reading KM 0+000 just after noon on January 31, ending a 400-mile, seven-day trip from Yangon to the site of a proposed special economic zone in Dawei, Tanintharyi Region. A crowd of more than 100 people burst into applause as the riders pass both the concrete kilometre marker and a very different sign: a poster with a photo of President U Thein Sein and principles he has espoused for foreign investment, including ?to protect the integrity of Myanmar citizens? and ?to allow environmentally-friendly investment?. The awareness-raising bike ride, as well as the civil society members and residents who turned out to meet them, are all indicative of the rapid rise of citizen activism in Myanmar. The extent to which this resistance has spread throughout the area portends significant challenges for the government?s plans. The Dawei Special Economic Zone (SEZ) is slated to be the largest industrial project in Southeast Asia, with an initial investment of US$8.2 billion. If the project goes ahead as planned, it could eventually cost as much as $60 billion and cover up to 204 square kilometres, not including an associated reservoir or road and rail corridor to Thailand. Myanmar and Thailand signed agreements to build the deepwater port and industrial complex at Dawei in 2008 and 2010 and work on access roads to the site started in 2011. Thailand hopes to benefit by converting itself into the ?transport hub? of Southeast Asia, with high speed and freight rail links to China, Laos, Cambodia, Vietnam and Malaysia meshing with the proposed rail link to Dawei. The project has attracted significant support from leaders of both countries. It also comes at a time when Myanmar is trying to attract greater foreign investment, particularly in manufacturing. But the political reforms that have accompanied the recent economic liberalisation have released pent-up frustration over the project and allowed activists and residents to raise their voices in protest. Green Bike is a Yangon-based cycling group dedicated to promoting bicycles as a healthy and sustainable mode of transportation. The group left Yangon in the pre-dawn darkness of January 25: a dozen riders ranging from a former Air Force cycling champion to a 14-year-old student. Over the next week, they were welcomed at villages along the way by youth organisations holding signs and flowers, slept in monasteries and churches, and passed out literature about the benefits of cycling and the importance of sustainable development. On January 31, they arrived at Kilometer 0+000. The group?s ?green? orientation extends beyond the bikes to other environmental and social issues. The trip to Dawei was planned in part to raise awareness about the economic zone. ?When I reached here and I listened to the villagers, it seems they?re really worried about relocation: they worry about their livelihoods … they worry about their lives,? said ride organiser Ko Thet Nai. The night after their arrival at the SEZ, the Green Bike group slept at a monastery in Ma Yin Gyi village as guests of the head monk, U Aw Ba Tha. 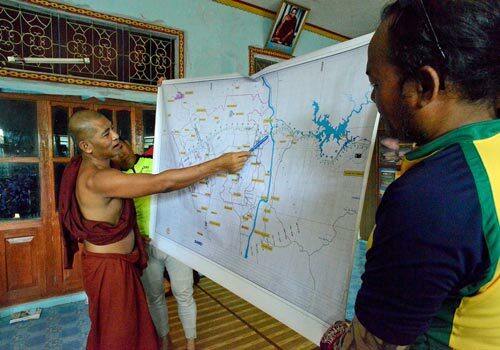 The monk is one of the founding members of the Dawei Development Association (DDA), a grassroots activist group focused on sustainable development and property rights in the area. The Dawei SEZ is one of the group?s core concerns, and Ma Yin Gyi is in the epicentre of the massive project. More than 32,000 people live in the 204 square kilometres of the proposed development. Almost 4000 families in 21 villages face relocation from the port and industrial area. ?I have no hope to get anything from the company. My eyes fill with tears when I think of the future of this village,? the monk said in the monastery?s main hall. It is a view echoed by everyone I spoke to in the affected area. Monks are at the forefront of the fight against the project. ?If these monks did not stand with the people, all this would not be possible. … The government, once they?ve see the money, they don?t care,? Ko Thet Nai said. 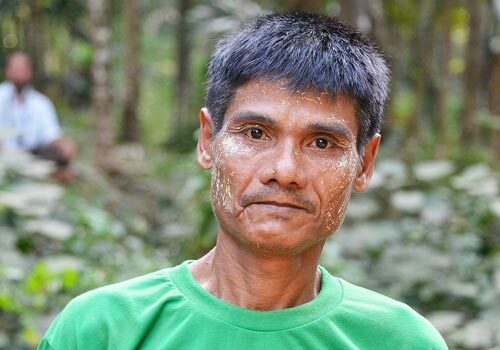 U Su Kyi Tha, a monk from a nearby village monastery, added: ?We don?t want compensation because the companies just take the land and give money. But villagers have no experience with money. They know how to grow crops but not [manage] money. To force farmers to work in factories is not positive development.? At a gathering that night of more than 100 people from villages in the surrounding area, U Aw Ba Tha was more optimistic, and more encouraging. ?If you don?t like this, don?t be afraid,? he told the crowd. ?We have our basic rights. You can stand up for your rights!? The next day, in the village of Mu Do, the bike group stopped at a roadside teashop for a break. Mu Do is the first village scheduled for relocation ? residents will have to leave next month ? and the people we met were angry. U Thin Ladd, a villager and former military officer, was adamant that they would be worse off under the relocation plan. ?The new houses are not good quality, not fit for human settlement. It?s not the way to run a democratic country, not listening to the people?s decisions,? he said. ?The companies work with the government ? they don?t care about the people. They think the people here are uneducated, so they can do what they want.? His friend, U Aung Myint, broke in, adding: ?In the new relocation site, there are no jobs! We are not sure what to do. Now we have crops. After we move ? no land, no jobs. ? They give only one house per family. But we have extended families! Now there are 576 houses in the village, but we?re only going to get 343 houses. How can we manage?? ?The company said that we could get jobs on the construction. But we applied more than a month ago and have heard nothing. People from away get jobs, but locals don?t. They?re always asking for money to get jobs ? there is corruption everywhere!? This sort of outspokenness, unthinkable only a few years ago, is common inside the proposed SEZ. Most of the ire is aimed at the company in charge of the project, Italian-Thai Development, the largest construction company in Thailand. A visit to the project?s relocation site in the village of Bawah showed why residents are upset. Hundreds of newly built houses stand in regular rows on sloping open ground. At first sight, the houses look quite modern: concrete pilings, cinderblock walls and metal roofs instead of the traditional wooden houses of the villages. The reality may be less impressive. ?The relocation area is no good. The houses are bad quality. Twelve houses were damaged last night by the wind, one almost destroyed. And I have no hope that anything new will be better,? U Aw Ba Tha said earlier that day in Ma Yin Gyi. Of the wrecked house, only the concrete frame remained. Next to the wreckage was a traditional wood and bamboo house with thatched roof. ?I heard a strange sound, like thunder in the night. When I woke and looked, I saw that the new house had collapsed. A part of it hit my house,? said Su Kam, the owner of the wooden home. Above his head, the wooden eave was dented but intact. Despite living in the middle of 343 new concrete houses, Su Kam chose not to leave his traditional house ?because my old house is better?, he said. Ko Ley Lwin from Ya Laing village is also a member of DDA and outspoken in his opposition to the project. Talking the morning after the meeting in Ma Yin Gyi, he said he first learned of the project when a friend read a description in a Thai newspaper. In 2008, a ?feasibility study group? came to his house, and he asked a member of the group what they were doing. They said they were studying the proposed SEZ but did not know when it would start. ?That?s the first news I got from the company,? he said. He is concerned about the impact of relocation on the people in the area. ?When they move the villagers to another place, I think that there will be problems occurring … within the villages and between the villagers and the government officers and the officers of the company.? He said the country?s recent moves towards democracy had been critical for enabling residents to speak out. ?After the changes, we have a small chance to speak, a small chance to organise, a small chance to move for our rights. I want to say thank you for our government.? But for many villagers from the Dawei are ?there is still a little fear, they have had bad experiences in the past under the old government.? And in the future? ?I want to say that our villagers and our people are united. Unity is the strongest. If we have unity, we can decide our life and future … Me? I will stay here until my last breath.? Ten kilometres north of the SEZ, in a narrow canyon of black rock, a concrete survey marker by the side of the road shows the proposed location of a dam that would supply water to the zone. Above it, neatly written in white paint, a message reads ?NO DAM.? The idyllic valley of Kah Lone Htar is an example of the conflict between large-scale industrial development and the ?sustainable development? advocated by many residents and civil society activists. The village of Kah Lone Htar is technically outside the zone and its compensation mechanism but it would be completely submerged by a reservoir supplying water to the industrial zone, and its residents appear united ? and organised ? in their opposition. A village of 182 families and about 1000 people, it sits in a wide valley covered with betel nut and cashew plantations. Like many in this area, the residents of Kah Lone Htar consider themselves well-off, and their well-built houses and new motorbikes testify to their prosperity. As in Ma Yin Gyi, the opposition movement has been led by the village?s most senior monk, U Pyin Nyar Wun Tha. ?The community thinks that if they move, they?ll face problems, so they have to protest. We agreed not to sign the agreements because we have to protect our village. Just like we?d protect our nation,? U Pyin Nyar Wun Tha said. As the villagers prepared to welcome the Green Bike riders ? its youth group was outfitted in green T-shirts reading ?no dam, no relocation? in English and Burmese ? U Pyin Nyar Wun Tha talked about his work. ?The village has four committees; together we organise to educate the villagers about the problems we?re facing. To do this is approved by Buddhist teachings. Some people say that this is not a proper role for monks. But the Buddha says that we have to benefit the society. I have to work according to the Buddha?s teachings.? Asked whether the village should be sacrificed for the success of the project, he replied: ?Some people say, ?The project can generate much profit. This means that we must move one village.? I know that many big projects have few benefits for the local communities. … But this village is very self-sufficient, with enough money from our plantations, fields and gardens: we don?t need anything from the company. Businessmen see only their own profits. ?They should do the project in a way that is less harmful to the environment. This village has many natural resources. They should build the dam in a different place.? He said tourism potentially offered an alternative development strategy. ?We will warmly welcome anyone who comes to the village. If visitors come to the village, we can take them to many beautiful places.? After lunch, villagers took a group of visiting activists up the valley to local waterfalls, some of the most impressive in Myanmar but virtually unknown outside the valley. In one tributary valley four cascades, the tallest several hundred feet high, poured down into deep pools of clear water. The Kah Lone Htar region clearly had the potential to become a major attraction if southern Myanmar opened up to tourism. The waterfall itself seems enough to ensure a steady supply of visitors. ?We villagers don?t want the dam; we?d rather have tourism developed,? said villager Ying Ngan, at the bottom of the falls. ?If tourism comes, there will be many benefits to the village. ?Italian-Thai says they will make the dam, but we don?t agree; we want to protect our land and our farms … I don?t want to stop the whole project, I want them to build a dam away from people. A smaller project would be better.? It appears the Myanmar government may be taking note of the scale of the opposition to the SEZ. At the monastery in Ma Yin Gyi, Ko Ley Lwin told the assembled crowd on January 31: ?I?ve heard news that the project area will be reduced more and more. But Thailand doesn?t admit that this is true.? Recent reports indicate that the Myanmar government wants to reduce the size of the zone from 204 square kilometers to 150. This downsizing, however, is unlikely to satisfy the villagers who would still have to relocate. A planned 3600-megawatt coal-fired power plant at the site was cancelled after opposition from environmental groups but a huge 1040-megawatt hydropower dam on the pristine Tanintharyi River could be build instead, with significant consequences for the region?s biodiversity and fishing industry. The government has also announced that it intends to broaden the project to make it less reliant on Italian-Thai Development and it seems Japanese firms will likely be involved. With more clarity about the foreign investment environment, industrial investors are starting to look closely at the site; the Green Bike visit to the zone was followed closely by two groups of potential Thai investors comprising more than 150 people from several dozen corporations. Most disturbingly for the villagers, at a speech in Dawei town hall on January 28, Deputy Minister for Social Welfare, Relief and Resettlement U Phone Swe railed against citizen activists like those opposing the SEZ. 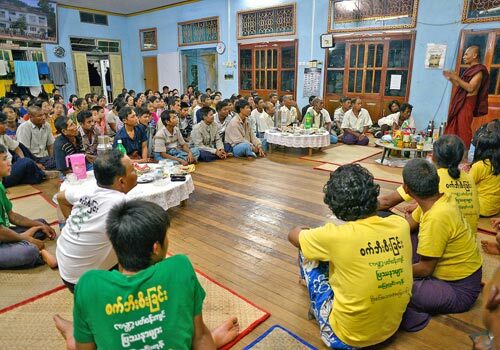 A Dawei resident who attended the meeting said the minster called on people to form ?civil military groups to defeat the opposition to the project?, adding: ?Now we see the enemy! The purpose of these militias is to defeat the enemy!? It was unclear exactly what this would entail, but within the SEZ this news was greeted with alarm. At the meeting at Ma Yin Gyi monastery, one man said: ?I?m from Paradat village. They have a list with 30 names of villagers for the militia. They said that my name was on the list.? But U Aw Ba Tha said the militia proposal was ?designed to make the villagers fight with each other?. ?Nobody should be afraid. We have our basic rights … If we cooperate and are strong, even the president cannot make us move.? U Pyin Nyar Wun Tha had similar advice. ?We have heard that the authorities may make militias but we don?t worry. If the authorities bring militias to the area, we don?t care because we have to protect our village,? he said. ?The authorities have to do what they think is right, but we also have to do what we think is right.? Just a few miles from where the ride ended in Dawei, Green Bike organiser Ko Thet Nai relaxed on Maungmakan beach. ?We used to live here in a traditional way; our environment and our people were very harmonious and sustainable. But when we follow ?modernisation?, a lot of problems happen because people don?t care about our cultural values, people don?t care about our local wisdom, they just blindly follow modernity. Which is really, really dangerous for us,? he said. ?As for the emphasis on big industrial zones, maybe it can be a benefit for the short term; it cannot be a benefit for the long term. And then we can see who will win. For me, when I came here and talked to the villagers, definitely the villagers lose.? Despite the scale of the Dawei project and its apparent high-level support, he is guardedly optimistic. ?I foresee the civil society here is strong enough to fight against whatever they want and for whatever they want. ?